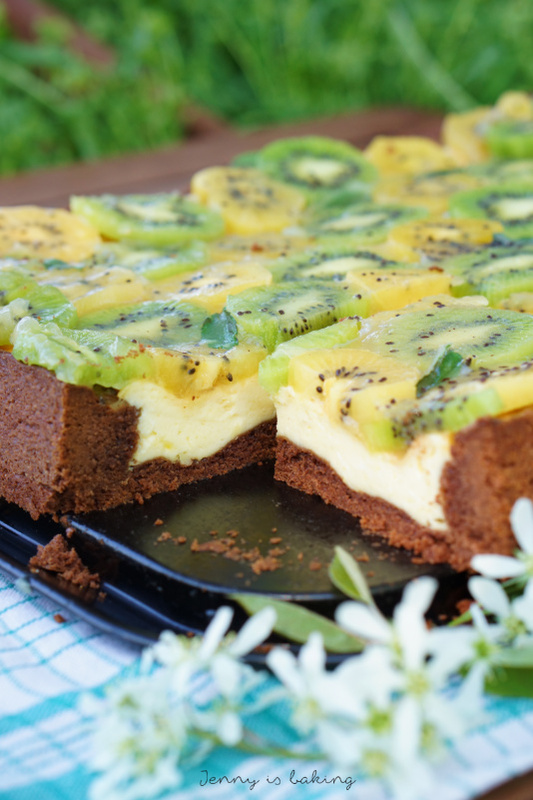 Today I am introducing you to a kiwi cream cheese cake with a chocolate crust as sheet cake. We actually ate this cake with some friends on a wonderful sunny weekend in Hamburg and it was the perfect cake to take along to eat outside, picnic style. This is a no fuss cake, easily transportable, you can cut it and eat it without any silverware. I had originally planned to bake this cake due to the fact that I am organizing the blog event “Colorful Food”. I invite you to bake/cook something in one of the seven rainbow colors: red, orange, yellow, green, blue, purple, or pink. For further details, please check here. I will introduce all seven rainbow colors here. For red strawberry pancakes please go here, for orange mini mango cakes go here, and for yellow please have a look at this lemon soufflé. The colors blue and green freaked me out at first. I mean, if you have a baking blog like I do, you can’t use that many vegetables in order to produce something in green, can you? So it was clear very early on that I wanted to make something with kiwi. I had never made a cake with kiwi, let alone a sheet cake, so I googled and checked which recipes are already out there. 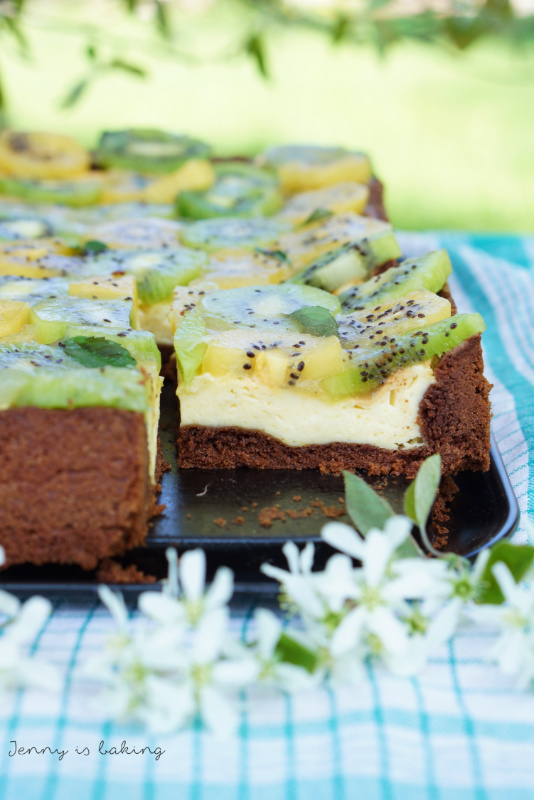 This recipe (in German) actually caught my attention because it is a very unusual mix, chocolate crust, cream cheese filling plus a kiwi topping. I was intrigued. So I tried it and took it to our picnic. To see how my friends would react. 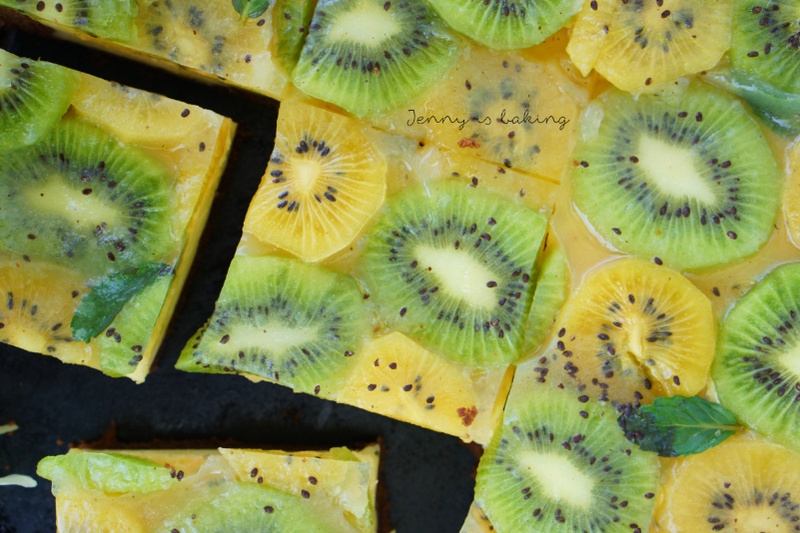 Many, just like me, had never eaten a cake with kiwi, let alone a sort of cream cheese cake with kiwi topping. But everybody was excited, so I decided to post this rather unusual recipe. Maybe I can get you to bake it, too. 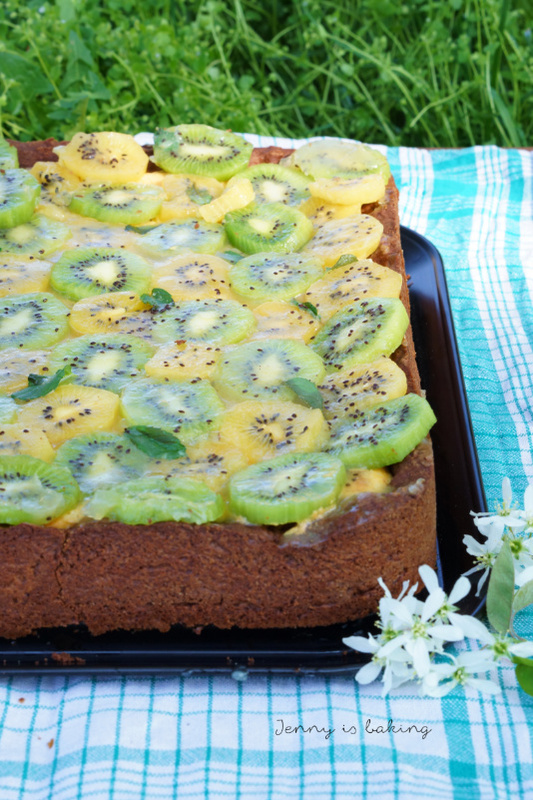 As stated, think chocolate crust, a creamy cream cheese, topped off with some kiwi. I know, it sounds crazy, but it is actually good! Very good! To make the chocolate crust place all ingredients in a large bowl and using a hook attachment, form into a ball. I like to use my hands at the end. If dough is too crumbly, add a teaspoon of milk. Line a casserole dish or square dish of 35x24cm fully with the dough including the sides. If necessary pat down dough with your fingers, be sure work to the edges neatly. Set aside. For the cream cheese filling place all ingredients except for the eggs in a large bowl and mix until creamy. Add the eggs, one at a time. Pour into prepared baking dish and bake for about 60min. If it becomes too dark, shield with aluminium foil. Let cool. Meanwhile for the topping peel and slice all kiwis except for one. Once the cake has cooled, place kiwi slices on top, alternating between colors. Puree the one reserved kiwi. Heat agar agar with water and sugar and let boil for two minutes. Add the pureed kiwi. Pour mixture hot on top of the kiwis and let cool. Cake also taste wonderful on second and third day. Serve chilled. It was actually very delicious! Give it a try!